The 4 x 4 inch Daisies tile is one of the first tile designs to be made by Emu Tile. It was inspired by the daisies which grow wild and in yards around Ohio and beyond. Some consider it to be a weed, but we love the humble daisy because of its simple and old-fashioned beauty. This daisies handmade ceramic tile can be glazed in any one of our current glaze colors. The tile can be displayed in any room of the house in a variety of ways. Hang it from a nail, or install it permanently! Every tile is carefully crafted by hand out of a stoneware clay, and then it is high-fired for durability (which just means it gets very hot). This is a relief tile, made in a traditional style press mold, but the design is original. 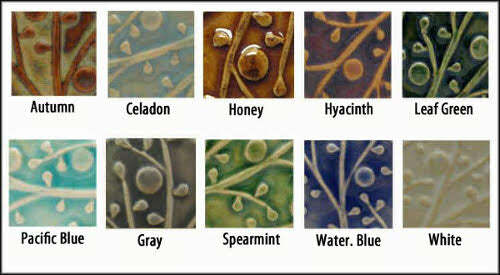 All of our glazes are lead free and cadmium free.